General Hospital (GH) spoilers reveal that there’s some hot comings and goings news to pass along. First, let’s talk about a recent guest appearance. Vince August just popped up as Officer Peterson, but his background is what makes this cast addition interesting. August was once a judge, but he gave up his career to become a full-time nightclub comic. He eventually branched out and started auditioning for television roles. Instead of ending up on a comedy show, August landed the part of Officer Peterson on GH. This guy’s story is almost as wacky as Nathan’s (Ryan Paevey) Ask Man Landers drama! Speaking of Ask Man Landers, General Hospital spoilers state that Jennifer Bassey (Quinn the publisher) has a return appearance coming up. Nathan and Amy (Risa Dorken) were ready to put this advice column to rest, but Maxie (Kristen Storms) felt like she deserved to reap some benefits. She’s only faced headaches and chaos so far. Now that Amy and Nathan have agreed to keep up the ruse, there’s going to be big trouble. It sounds like Maxie will wish she’d just let it go! The whole scheme will likely be exposed pretty soon. Nathan could face fraud charges and Amy could be forced to pay back money she no longer has. Quinn will likely get caught in the middle of that mess. 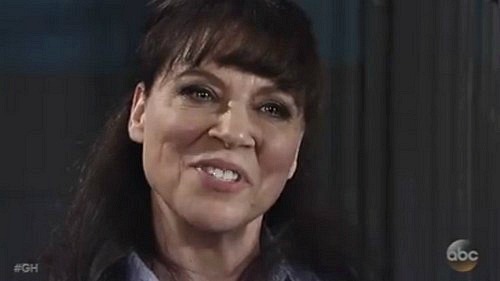 In other casting news, the brilliant fan-favorite Kathleen Gati (Dr. Obrecht), of whom we see far too little on GH, has signed on for a fun new role. She’ll be playing Margaret Cranston in Ladies of the Lake. This soapy show drew fans in last season with popular daytime drama actors as well murder mayhem. Gati will be included in three episodes of this four-part series, which begins filming at the end of January. You can look for LOTL in 2018, but be sure to check out Dancing with the Stars in the meantime. Kelly Monaco (Sam) will appear during the episode airing November 6. The former contestant who won the first season of DWTS will be strutting her stuff for Trio Week, so tune in! It sounds like the GH cast is staying busy. We’ll give you updates as other General Hospital details emerge. Stick with the ABC soap and don’t forget to check CDL often for the latest General Hospital spoilers, updates and news.